There was a time not too long ago when small towns were the settings for the weightiest American stories: Inherit the Wind, To Kill a Mockingbird to name just two. More recently, however, the big stories have left small town America for the city, and small towns have become favored settings for smaller stories. From Cicely, Alaska (“Northern Exposure”) to Lake Wobegon (Garrison Keillor) to the New England villages of John Irving, we now patronize stories about small towns lacking big drama—places where life moves slowly enough for everything to be distilled and examined within the crucible of small town myopia. The most recent novel to mine this vein is Jim Stinson’s Tassy Morgan’s Bluff. Mr. Stinson brings his readers to San Andreas, on the northern California coast. San Andreas is a sleepy fishing village gradually being remade by affluent émigrés and a growing tourism industry moored to a nearby Indian-tribe casino. As the town’s name implies, San Andreas is split along a fault line: residents who want to transform the village into a quaint tourist destination vs. those who like its nautical seediness. And that fault line runs out of the village along a steep bluff and beneath the modest cottage of seascape artist, Tassy Morgan. Passionate, talented, and attractive, Tassy Morgan is largely aloof from the village and its small-town intrigues. Then a manipulative realtor, Margaret Nam, determines Tassy’s cottage an eyesore and safety hazard. With support from the village’s lap-dog mayor, Nam attempts to force Tassy into conformity with the village’s gentrification. Battle lines are drawn when merchant Orson Wellsely and village attorney and budding love-interest Linc side with Tassy. Before the book’s end, a dozen other characters are drawn into Mr. Stinson’s fast-moving, lighthearted comic opera about small town politics and falling in love a second time. There is much to like about Tassy Morgan’s Bluff: Mr. Stinson somehow makes zoning ordinances and land use regulations interesting topics, explaining just enough to inform, but never enough to bore. References to art, wine, and classical music give the book a highbrow veneer, but only a thin one. Oddball second tier characters like Day-Glo Dave, Bill the Fixer, and Jimi are pleasant diversions. And author Stinson steps out of his breezy narrative a few times to write memorable scenes, i.e., Tassy’s awful discussion with her estranged daughter, and a tense break-up between aging womanizer Norman Stihl and Nam. However, Tassy Morgan’s Bluff is nicked by two flaws. First, Tassy is a hot-tempered, introverted, émigré artist in a small town where gossip is currency. Her rising popularity later in the book is out of sync with what we know about her and the town. Second, the two most manipulative characters in the book are Margaret Nam, an Asian, and Grandma Halversem, a Native American. It is unfortunate that in a book with only two prominent non-white characters, both are so Machiavellian. 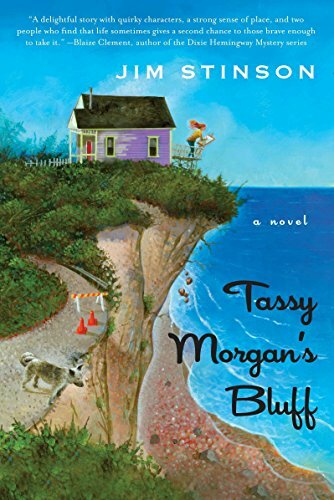 Tassy Morgan’s Bluff offers interesting characters and brisk narrative; it is a good book because it does not strive to be a great one. Like Tassy Morgan’s cottage, this book sits on a tricky fault line: the line between literary fiction and so-called chick-lit. It is a precarious tightrope, but Mr. Stinson balances nicely.